Book Review: Charm & Strange by Stephanie Kuehn - Book.Blog.Bake. Charm & Strange is an apt title for this book. Whatever preconceived notions I had about this book based on the summary alone flew promptly out the window once I read the first chapter. For so long, I didn’t know what this book was– is it paranormal? Horror? Contemporary? Ultimately, why I would say Charm & Strange defies all labels, the best genre for this book would be Psychological and at that it exceeds. The chapters alternate time lines, which is a technique I have conflicting opinions on. Sometimes, I really hate it, but not so here! The chapters are labelled by “Matter” and “Antimatter”, and it wasn’t until the book ended that I really saw how all of it, including the labels, fit together. 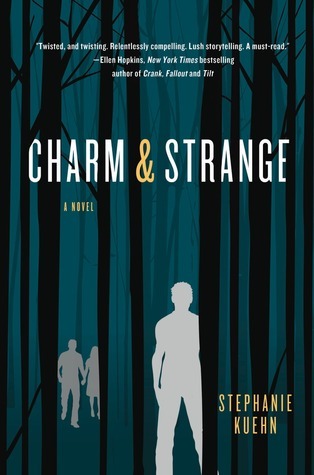 Charm & Strange’s biggest strength is how wonderfully Stephanie Kuehn seems to have mastered the gradual plot reveal. Almost every chapter something new is revealed, but each time it leaves the reader wanting more. Kuehn does an excellent job of building up suspense without letting questions go unanswered for too long. Win’s narration is perfect and heartbreaking. The entire book I just got a sense of the broken boy that was Andrew Winters. I felt pity and sympathy, which is a remarkable feat. Considering how much of the book is Win hating himself, I never found him annoying or self-indulgent. This book isn’t for everyone. The plot is not thick or complex, besides the gradual reveals into Win’s past. At heart, it’s a psychological character study that isn’t afraid to shy away from tough subjects. There are things in this book that made me uncomfortable and at one point I almost put the book down, even though I didn’t want to step away from it. Once I started reading this book, I couldn’t stop. I got sucked into Win’s world and his story. This book’s pretty short, at about 220 pages, but there’s SO MUCH in those 220 pages. SO MUCH. So much pain, so much brokenness, so much uncertainty, so much beautiful writing. As stated before, this book won’t be for everyone, but I do recommend it for those who enjoy psychological stories and tough issues. Final Impression: Charm & Strange took me completely by surprise in a good way. It’s intricate, with a narrator whose very, very broken and confused. The writing is simple, but effective, and all I wanted the entire time is to know what had happened to Win and what would happen to Win. 4/5 stars. You can order Charm & Strange at Amazon or Barnes and Nobles. Also, self-hosting!? When did this happen? Yey! Self-hosting? Feels like forever ago, but just last week! Also the day before I went out of town, which in hindsight might not have been the best idea, but it’s all good now! I read a spoiler so I know what its about. I think it’s one I’d like to try. I love when a book exceeds your expectations like this one did for you. Wow — this sounds really interesting. I had no idea what it was about, but it sounds like something I might enjoy!